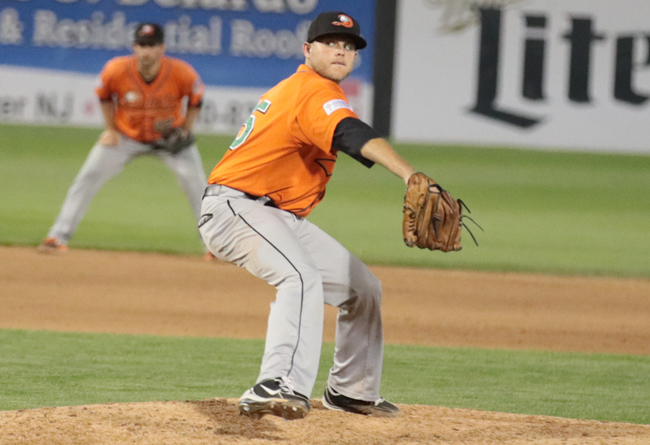 (Bridgewater, N.J., Sept. 22, 2017) – The Long Island Ducks defeated the Somerset Patriots 6-1 on Friday night in Game Three of the Liberty Division Championship Series at TD Bank Ballpark. Long Island now leads the best-of-five series is two games to one. Jake Fisher (1-0) was the dominant on the mound for Long Island, turning in a complete game effort for the win in his first professional postseason start. The southpaw tossed all nine innings, allowing just six hits and two walks while striking out nine batters. He threw 115 pitches in the outing, 89 of which were strikes, and allowed just two baserunners to reach third base in the game. The only run the 27-year-old surrendered came in the ninth inning on a two-out double to left field by David Vidal. The Ducks erupted for three runs in the first inning against Patriots starter Will Oliver to take give Fisher the early lead. RBI singles by Lew Ford and Marc Krauss, along with a run-scoring fielder’s choice off the bat of Angelo Songco, highlighted the inning. It stayed that way until the sixth when Long Island added a pair of two-out runs to extend the lead to five. An RBI single by Dan Lyons followed by an RBI double from Giovanny Alfonzo did the damage. Anthony Vega rounded out the scoring with a towering two-out solo homer to right in the eighth off Patriots reliever Kyler Newby. Oliver (0-1) suffered the loss, surrendering five runs on 10 hits and a walk in six innings while striking out four. Eight of the nine Ducks batters registered at least one hit in the game. Krauss led the way with three hits and an RBI, while Alfonzo and Ford each added two hits, an RBI and a run. Elmer Reyes and Alex Burg each added two hits and scored a run. The Ducks and Patriots continue the Liberty Division Championship Series with Game Four on Saturday night. Game time is slated for 7:05 p.m. from TD Bank Ballpark. Fans can follow all the action on the Long Island Ducks Broadcast Network. Live streaming HD video and audio will be available via BoxCast on the Ducks’ official Facebook page, YouTube channel and at LIDucks.com. Right-hander Jake Dunning (2-3, 3.64) takes the mound for the Ducks against Patriots righty Patrick Johnson (2-2, 4.76).